(CW from Left) A collage painting dedicated to the founders and teachers of the V.S.K. 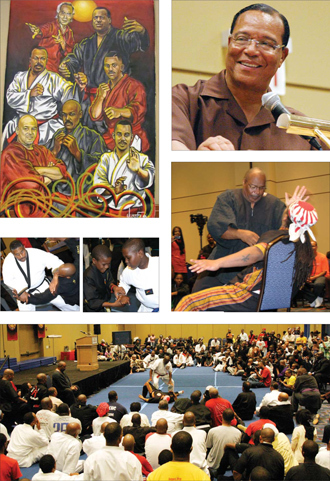 system of martial arts done by artist JustFlo; The Honorable Minister Louis Farrakhan; Soke Lil’ John Davis; Grandmaster Anthony Muhammad (center) demonstrates survival techniques. Grandmaster Anthony Muhammad (center) demonstrates survival techniques. CHICAGO (FinalCall.com) - Discipline, sharpness of mind and knowledge of self-defense gained from training in the martial arts was the focus of the United Schools of Survival (U.S.O.S.) Federation's 16th Annual Martial Arts/National Training Seminar held at the Hyatt Regency-McCormick Place Hotel, July 8-10. A special highlight to this year's seminar was the presence of the Honorable Minister Louis Farrakhan and his words of guidance and instruction. Themed “Continuing The Legacy: Forever Honoring the Masters, Past and Present,” Grandmaster Anthony Muhammad, the founder of the martial arts system V.S.K. Ryu Jiu Jitsu, welcomed nearly 400 participants from across the U.S. and the Caribbean representing a variety of martial arts systems. His vision was to provide an atmosphere where martial arts practitioners could apply the philosophy of “each one teach one” that ensures the students' continuance of what Master Teachers have worked hard to establish and teach. “U.S.O.S.” is the Federation founded and headed by Grandmaster Anthony under the auspices and permission of his teachers, the late Dr. Moses Powell (Master Musa Muhammad), founder of Sanuces Ryu Jiu Jitsu and Soke Lil' John Davis, founder of Kumite Ryu Jiu Jitsu. The annual seminar honors them, as well as Grandprofessor Florendo M. Visitacíon, founder of Vee Jitsu Ryu Jiu Jitsu, for these three men are the foundation upon which V.S.K. Ryu Jiu Jitsu was established. The weekend kicked-off with Friday's National Training Seminar, which specifically addressed aspects of security training for brothers and sisters within the Nation of Islam. This year's theme was “In That Day, Your Righteousness Shall Sustain You.” Participants engaged in informative workshops such as “Dignitary Protection,” “Delivering the Word of God,” “Disaster Preparedness,” and “Discipline in Motion.” Also, each brother and sister had an opportunity to acquire a “Check Post” certification through detailed course work and hands-on training in a class presented by Grandmaster Anthony, who also serves in the capacity as a Student Regional Captain, and is the National Trainer for The Nation of Islam. 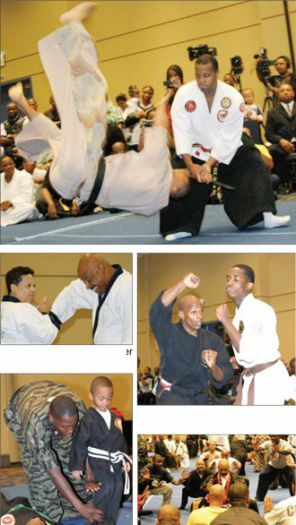 (top) Shihan Chris Muhammad (CW from left) Grandmaster Sandra Sumler displays art of self-defense; Shihan Lemuel Muhammad demonstrates technique; Quajanim Michael B. X. Hill demonstrates endurance techniques; Shodan Damon Muhammad assisting youth. On Saturday, the day began with two self-defense sessions geared towards children and women. The Children's Seminar was taught by honored teacher Soke Lil' John Davis on the importance of being aware of their surroundings. He said children should be wary of “the stranger” who might offer a kind word or extend their hand to greet them in order to get close enough to physically overpower them. The first half of the Women's Seminar was led by Grandmaster Sandra Sumler of Sumler's School of Karate based in Cincinnati, Ohio, who taught practical techniques that would help protect any woman from a male or female aggressor. Grandmaster Anthony and Soke Lil' John Davis closed out the session together by exhibiting how the women can “turn the table” on any attacker. “You should not look at yourselves as just ‘helpless women' if you are being attacked. You are warriors,” Grandmaster Anthony said. The Open Seminar that afternoon is where all students were grouped by belt rank into a three-ring rotation format where they learned physical training methods and self-defense techniques from 14 instructors representing different martial arts styles. The Honorable Minister Louis Farrakhan attended the Open Seminar accompanied by his son, Student Supreme Captain Mustapha Farrakhan. Once he was seated, Grandmaster Anthony brought everyone to attention to administer one resounding “Ous!” (bow of courtesy) to Min. Farrakhan. 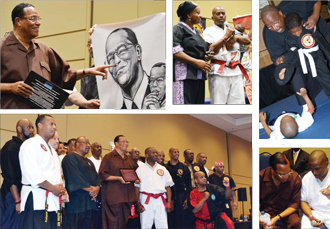 After a special martial arts demonstration by Soke Lil' John Davis, Grandmaster Anthony and other masters, Minister Farrakhan graced the stage to exhibit his mastery of the technique of sharing the wisdom and guidance given to him by his Master Teacher, the Most Honorable Elijah Muhammad. Minister Farrakhan then spoke on the “threshold of pain” that the teachers give their students in training, and the benefit of increasing that threshold as one who considers his or herself a “fighter.” He encouraged each student to increase their amount of training, for the time that we are living in calls for knowledge on how to protect ourselves and our loved ones. “We're living in a very terrible time of the downward spiral of human beings into complete savagery. And knowing this Art to be able to protect yourself, your families, your loved ones, your community: I know this [training] is going on all over the country, but it must increase. We must find ways to bring more and more people to the dojo, male and female, even down to the little ones, to study. The seminar closed with gifts presented to Minister Farrakhan on behalf of the U.S.O.S. Federation, including a beautiful painting of Minister Farrakhan by talented Chicago artist Just Flo. Grandmaster Anthony's students also showered him with gifts to show forth their honor and appreciation for him, which included a wall-sized collage painting by Just Flo of the founders and teachers within the V.S.K. system of martial arts. And on Sunday, martial artists from all over competed in the action-packed U.S.O.S. Annual Martial Arts Tournament, coordinated by Renshi Derian Winder of Chicago-based Good Champs Karate Academy. “I'm very pleased with this weekend's event. My hope is that the students will take back with them what they actually learned, and spread that information with others in their cities, that they may duplicate themselves,” stated Grandmaster Anthony.